Pakistanis for Peace and Manzer Munir cordially and humbly request you to please sign this petition to nominate Abdul Sattar Edhi for the Nobel Peace Prize. The Nobel Peace prize is an annual prize awarded to individuals who have made formidable contributions to the pursuit of peace and have, through their work, changed the world for the better. As the founder of Pakistan’s largest welfare organization, the Edhi Foundation and trust, Mr Abdul Sattar Edhi embodies the spirit of this prize, and is a deserving candidate for this honour. He has single-handedly served countless Pakistani’s and has left a lasting impact on his fellow countrymen and the world. Quite simply, there has never been anyone more deserving of the Nobel Peace prize in its entire history than Mr Abdul Sattar Edhi. Please help us get him his dues by having him finally nominated this year. 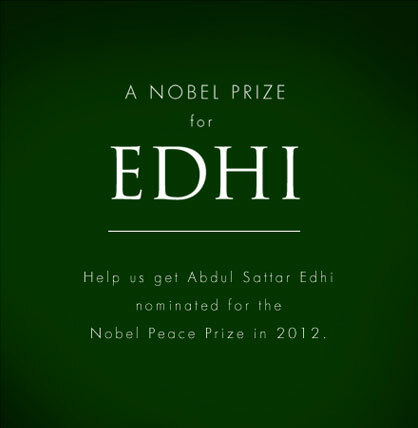 Please sign this petition to show your support for the nomination of Mr.Edhi for the 2012 Nobel Peace Prize.